I've been on a few threads where more than one person, including myself, felt like underground mining wasn't really what it was in A16 and seemed harder to find certain materials. I couldn't really take not knowing what has changed or what seems to have changed. So I did what I saw someone else had done and uncommented the visualizations in the blocks.xml config file. Hopped back into my game, flipped on Debug, flipped on God Mode, and took a spin flying around underground. Some... Interesting things. And... This is purely desert. So if anyone wants a research project, go for broke on the average behavior of all the biomes. 1st. There's less iron man... Kinda. A16, you'd find iron at bedrock up. Not exactly true in A17. As a matter of fact, I saw no Iron actually in the bottom 10-15 blocks of the map. Other deposits, but not iron. 2nd. Iron is underground, however... It seems that Iron now spawns underground, but on top of other resource veins. 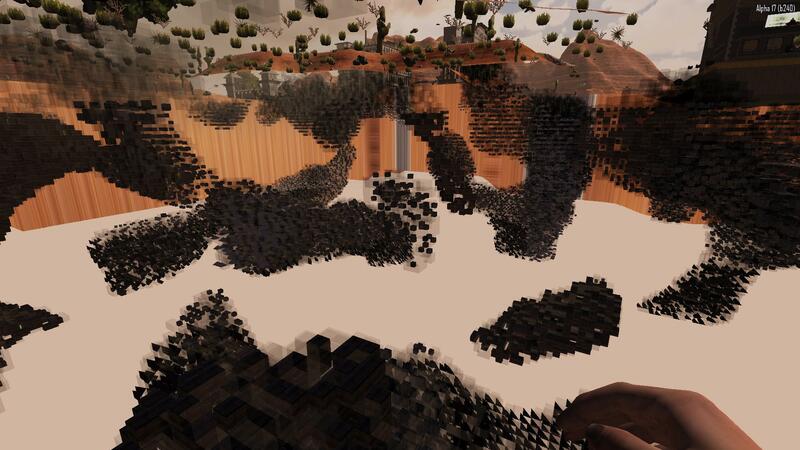 You'll see in the screenshots below Oil Shale, and on top of it, are Iron Ore blocks. Basically what this means, is if you are underground mining, and you hit a biome specific vein especially, dig UP. Find the top of it, then dig around the top of the vein. You'll find... some... iron. 3rd. Iron is a near surface ore. It's fairly clear in the screenshots below. Iron is spattered around underground as mentioned in point 2 above. However... Iron has a MUCH greater abundance in the top 30 blocks of terrain in the world. 4th. Nitrate and Coal are almost non-existent in at least the desert. Kinda similar to A16, but IMO it seems much less frequent and much smaller in the amount of these two resources than I'd find in A16. 5th. Lead is just stupid abundant. It's... Everywhere. In the desert area I'm at, at the very least, there is almost as much lead as there is Oil Shale. My Personal Opinion: I have no idea what TFP was thinking in this type of ore distribution. I don't know why Iron Ore would literally be placed sparingly on top of most biome specific resource veins. But, hey, at least we have a pattern to look for now right? I think TFP kinda moved the slider on Iron and Lead. Increasing the amount of lead you'd find underground, but decreasing the amount of Iron Ore. I also think TFP assumed we'd figure this out. And to couple with the AI changes and digging, the majority of the iron was put within 30 blocks or less of the surface. Which... if I remember the AI discussions correctly, that's the max distance AI will look to find a path to a player. Go fig. My suggestion to all you underground miners... And what I'll be trying myself. Find a vein of biome specific resource? Dig up. Find the top of it. Then dig around. Seems like the iron is basically set as a flat slab on top of those resource veins. But still... Well below surface. NOTE: For some reason the IMG tag doesn't want to work with me. I'll try to get the screen shots up shortly. First Image: Lots of iron within the top 30 blocks of terrain. Second Image: Iron Ore sitting on top of an Oil Shale Vein. Third Image: Lots of resource deposits nearer the surface. There are resource deposits underground, but there are bigger gaps between resource veins. I should have taken other screen shots because there are oceans of emptiness underground by bedrock. Last edited by Jackelmyer; 02-02-2019 at 04:03 AM. yeah. You're most likely rolling on resources. lol. Any digger troubles with wandering hordes? There was one time, but it was where I started digging down. It was a real stupid mistake. I should not have dug straight down without at least some structure defending the hole at the surface. EDIT: It was a pack of old-timers... so it was a good blow to the ego. Last edited by AtomicUs5000; 02-01-2019 at 11:30 PM. Theoretically, From the Shadows could help, but I'm not sure. Third Image: Lots of resource deposits nearer the surface. Resource deposits underground, but there are bigger gaps between resource veins. I should have taken other screen shots because there are oceans of emptiness underground by bedrock. Thanks for the info. Can you reupload the images? All 3 images look the same. Can you circle or mark the relevant parts? Eg. in the 2nd image where is the shale deposit? Sorry about that. I guess dropbox doesn't agree with this type of file sharing. Yeah that definitely seems to be the magic spot. In my hundreds of hours in the various builds of A17- and I do a LOT of mining... I always have a super abundance of iron, and it's the other resources I am struggling to find. Iron IS the dominate ore of every biome. Hordes are GOING to find you eventually... I just make very long tunnels and if 1 area draws attention I run through my tunnels to different spot to lose them all. Later game I just don't even care when I have good armor, I take the sneak attacks and murder death kill them all anyways. It isn't that big a deal, and does not impede my progress that much. Mining and the underworld needs a complete re-imagining. But I doubt we'll see very much of that because of performance reasons. But thanks for the investigative work. I need lead always, so I guess I should do more desert mining. Also I am offended by your toolbar layout. Clearly the fireaxe should be slot one, as it gets used the most. All the safe cracking, door breaking, harvesting... I'm reporting you to the FBI-- Frequently Bound Items department. Hahaha welp..... we know what you were doin' right before that post. I AM AN OARFFICER OF THE LAWRE! WE DON'T DO DON'T DO DO UH DON'T DO, AND DO THINGS LIKE THAT! As soon as my vision clears I AM GOING TO FIND THINGS WRONG with your motor vehicle, and throw the books at you! And when you and your crooked lawyers try to throw your books at me in retaliation later, I'll cook them books! Now that's going to make the kind of SMOKE this officer likes to huff! Do you smell what the law is cookin? This is officer zombo first blood, and you have been BUSTED! Agreed, Im was swimming in iron ore pretty fast, its under every gravel patch I found. Early-mid game I had about 6 mines in different places and biomes and all had iron ore maybe 10-15 blocks form the surface. At first I hated the ore distribution but its actually a lot less random than the old way once you figure out how to get to it. It should have a much better explanation in the (early) game though!